Ivy Moore, an African-American maid, age 26, has worked for the Austin family for nine years, after arriving from Florida where she was raised by her grandmother. Despite being treated as a part of the family, she announces her decision to leave her job and go to secretarial school in order to improve her situation. The Austins are desperate to keep her, and the teenagers, Gena and Tim, hatch a scheme to do so. Tim Austin sets up Ivy with Jack Parks, a trucking company executive, to wine and dine Ivy. He hopes that the introduction of excitement in her life will dissuade her from leaving the family. Their initial meetings are awkward for the cosmopolitan Parks and the less sophisticated Moore, as they go to a Japanese restaurant and a bohemian nightclub in Manhattan. Eventually, however, romance blossoms, but when Moore learns that Parks was coerced into initially dating her, she breaks up with him. Parks overcomes his attachment to swinging bachelorhood and asks Moore to leave with him for New York City. She accepts. As they do so, they witness the illegal casino, which Parks had handed over to his partner, being pulled over by police and the operators arrested. The film opened to positive reviews and was liked by both black and white audiences. Many applauded the performances of both Sidney Poitier and Abbey Lincoln, and they were popular romantic leads. Even Ebony Magazine gave the two a cover story. Also applauded were Beau Bridges and Carroll O'Connor: later, both actors appeared in films and TV shows, some dealing with racial issues. Bridges did the urban comedy-drama The Landlord and other films, and O'Connor landed other roles as he made his way to TV glory as Archie Bunker on All in the Family. The movie earned box office rentals of $5,570,000 in North America with $1.7 million coming from the rest of the world. After distribution fees, prints and advertising and the negative cost were taken away, the film recorded a profit of $390,000. 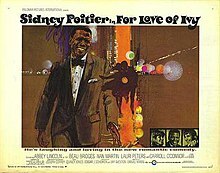 The film score was composed, arranged and conducted by Quincy Jones, and the soundtrack album was released on the ABC label in 1968. The title song performed by Shirley Horn, composed by Quincy Jones, with lyrics by Bob Russell was released as a single by ABC Records. While it isn't a race movie, or primarily about race, Jack Parks (Sidney Poitier) enjoys playing on the Austin children's racial stereotypes. The film was released on Region 1 DVD by MGM Home Video January 20, 2004. ^ "Big Rental Films of 1968", Variety, 8 January 1969 p 15. Please note this figure is a rental accruing to distributors. This page was last edited on 16 December 2018, at 14:07 (UTC).